I have always thought that it is more important to laugh than to take life too seriously. But recently, when I was in a medically induced coma, no one was laughing. Instead, my family was told that if I was able to come out of the coma I might suffer from post-traumatic stress. We went from having a Sunday family dinner to doctors asking my wife if she wanted to sign a do-not-resuscitate order since my chances of surviving were less than 25 per cent. I'd had an abdominal aneurysm and it ruptured. My body was in septic shock. I came about as close to dying as you can without actually dying. The good news was I did wake up. The bad news was that I woke up to a whole new world, a drug-induced delirium of disturbing and confusing hallucinations. In my new world I was confined to a hospital bed with numerous tubes and monitoring devices attached to me. Unable to speak or do anything for myself, I lived in a virtual reality that involved all kinds of bizarre and yet realistic sensory experiences. It was a difficult time, and a harrowing experience for my family. I was unable to find the humour in my postcoma confused state. 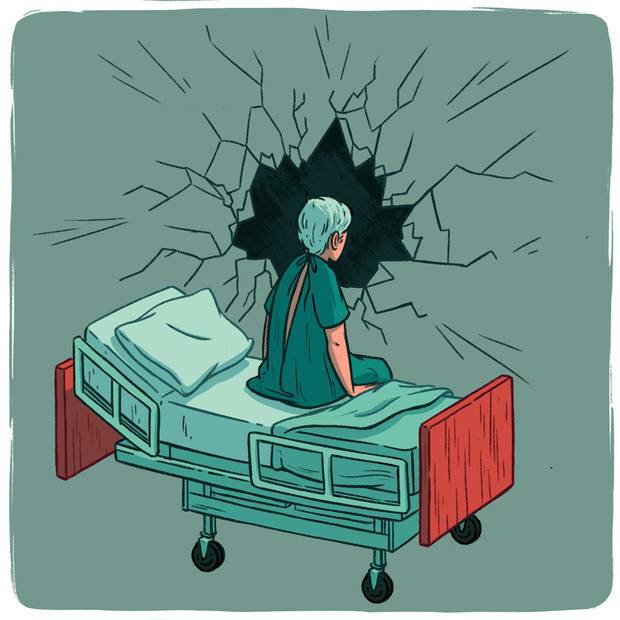 But I was buoyed by the hope that we would all get some help for what hospital staff referred to as "PTSD," given that I had had a nightmarish near-death experience witnessed by my family. When I asked about PTSD counselling, a hospital social worker came to see me. She politely explained that this was not an area of expertise for the hospital social workers or anyone else in the hospital for that matter. I was on my own when it came to recovering from what could also be called a "medical stress injury." Finally an opportunity to laugh! Humour is all about choosing to see the absurdity and incongruity of life. My family and I engaged in some rather rueful laughter, how ironic to be told that I might suffer from PTSD only to find out, in fact, that there was no PTSD help available. It was also somewhat humorous to return to visit the intensive-care unit six months after I was admitted, only to be told then that I would have vivid but inaccurate memories of being in the ICU. Ironically, I had come to this realization while I convalesced at home. It was then that I began to experience all the shock, horror, anger and ultimately elation about what had happened to me. I slowly put the pieces of my medical/psychological puzzle together. Much of what I had believed during those drugged months was an illusion. In a way it appealed to my wry sense of humour to think that if I had been told about these "memories" a few weeks after my surgery it would have saved me a lot of grief trying to figure out why I thought, among many other things, someone was trying to kill me and steal my car. I had a good laugh, too, about the polar bear I thought was living in a cage on the bridge adjacent to the hospital. I was happy to hear that the bear was safely ensconced at Assiniboine Park Zoo. On the other hand, it would have been fun to see this bear on the bridge when I got out of the hospital. The nurses were my lifeline; I loved their humanity and sense of humour. I think they even appreciated my feeble attempts at humour. But what I most appreciated about the nurses was their willingness to listen to my story. Being involved in a traumatic incident can rewire your brain, and not in a good way. But telling your story allows you to gain mastery over what happened. I told my story not only to the nurses but also to my friends and family, which helped me move along a healing path. Ultimately, however, recovery from a traumatic event has to involve the realm of finding meaning in what happened. Since I was released last spring, I have thought about this issue. Have I learned something that will help me to move forward in a positive way? I am not out of the woods yet. I still face more surgery. But I am happy, happier than I have ever been according to my family. I have learned to live in the moment and appreciate my family, my friends and my life like I never did before. I also feel very fortunate. I asked the doctors to connect me with other patients who had been through what I had been through – a week in a coma, three weeks in the ICU and 35 days in the hospital. I was told that they were either dead or too sick to talk to me. To honour these individuals, I want to keep sharing my story, to keep healing myself and maybe help others cope with traumatic medical stress. I still think it is important to laugh, laughter being a kind of confirmation that we are more important than our problems. At the same time, I am more serious about life. I think about how we need to care about others, to listen and make our lives count.